A large proportion of shot flying-foxes are not killed instantly but die slowly from injuries, infection, starvation or dehydration. 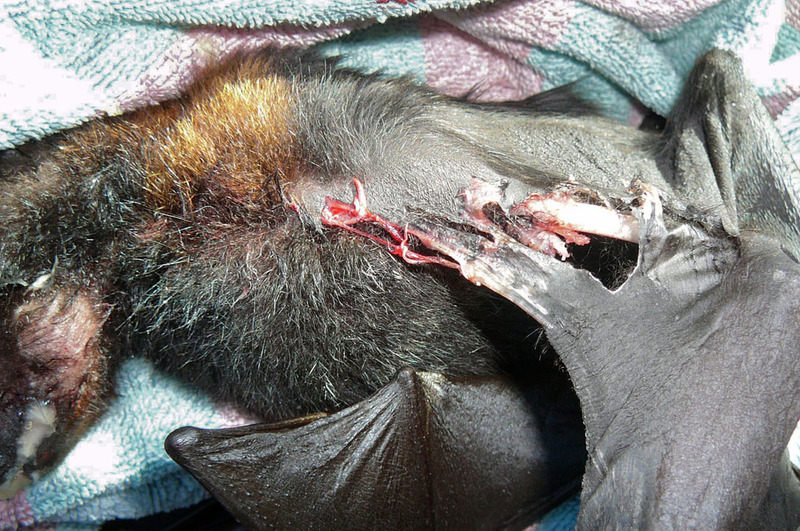 Electrocution causes agonising pain and can take several minutes to kill flying-foxes. Some die several days later from electrical burns, infection, starvation or dehydration. Most killing in orchards occurs while most females have dependent young. When their mother is killed, flying-fox babies starve to death. Because of the compelling evidence for their inhumaneness, shooting and electrocution of flying-foxes for crop protection is illegal under Queensland law . Qld law makes this Act exempt from the Animal Care and Protection Act, and the LNP has removed the legal requirement for humanness under the Nature Conservation Act . This has damaging implications for the conservation and welfare of all wildlife in Queensland. It demonstrates beyond all doubt that the Queensland Government knows that shooting flying-foxes is intrinsically inhumane. (That is, it is near impossible to kill bats humanely by shooting). Shooting a flying-fox humanely in an orchard at night is very difficult. Flying-foxes are dark and thus difficult to see and are likely to be wary and not allow a close shot. They are also a moving target as the animals are likely to be shot in flight to avoid damage to fruit. While the guidelines forbid this, it is common knowledge that the government is highly unlikely to monitor the shooting. Primary producers are able to obtain a firearms licence simply because of their line of business, and there is no requirement for a skills test. There is no guarantee that a fruit grower licensed to shoot flying-foxes has the skills to do so. Autopsies conducted on 58 dead or euthansed flying-foxes collected from a NSW orchard showed that about three-quarters of the shot flying-foxes were likely to have died several hours to days after being shot. 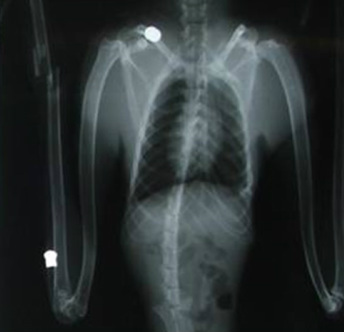 It is impossible for shooters to locate all injured flying-foxes for euthanasia, and many will not be motivated to do so. 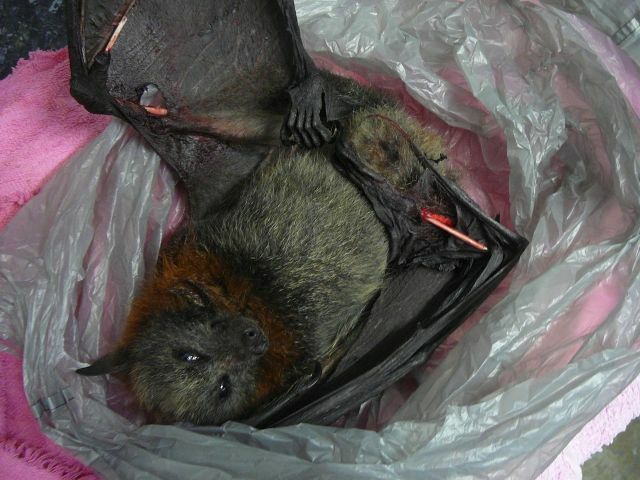 Less than 10% of dead animals found in the NSW orchard had been euthanased by shooters, despite a legal requirement for shooters to “locate each animal shot and promptly alleviate the suffering of any injured flying-fox by gunshot to either the head or thorax of the animal.” About one-third of the shot flying-foxes collected were still alive and the majority had to be euthanased. See here for a summary of the ‘Report on deaths and injuries to Grey-headed Flying-foxes, Pteropus poliocephalus shot in an orchard near Sydney, NSW'. It can take several minutes for a flying-fox to die on a lethal electric grid, from a heart attack due to ventricular fibrillation or from asphyxia due to paralysis of the respiratory muscles. The pain of electrocution is agonising due to sensations of intense heat, burning and suffocation. Electricity is, after all, used for torturing humans. Electrocution has only been permitted for humane killing of animals if the animal is first stunned by a current that flows through the brain. Because a flying-fox collides with an electric grid as it is flying, it is unlikely that current passes through the body in a way to cause rapid unconsciousness. 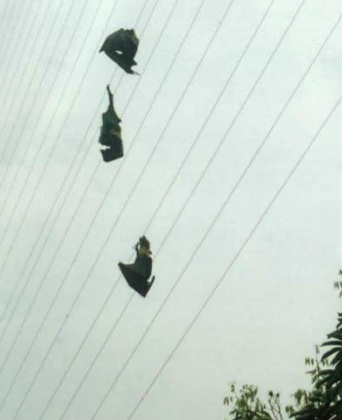 If a flying-fox escapes from an electric grid (as has been observed to occur), it may die after several days from electrical burn injuries or starvation. Flying-foxes treated for electrocution injuries "show signs of severe pain". See here for more information about electric grids. The evidence here shows that electrocution inflicts intense pain and agonizing suffering. Spectacled, Grey-headed and Black flying-foxes generally give birth during October-December each year, coinciding with summer food availability and also with the ripening and harvest of most orchard fruits. Flying-fox young are dependent on their mothers and suckle for up to six months after birth. For the first 3 weeks they are carried continuously by their mothers, after which they are left at the roost site while their mother forages . If they are with their mother when she is shot or electrocuted, they will die from that or from starvation, dehydration or predation. If their mother is killed while they are in the bat camp they will die from starvation, dehydration or predation. Dying can take several days. Even if there was some way of humanely killing flying-foxes in an orchard, there is no way of locating and humanely killing orphaned juveniles in the roost site. Because there is compelling evidence for inhumaness of shooting and electrocution, the only legitimate way to issue damage mitigation permits for killing flying-foxes is to remove the requirement for humaneness in Queensland's conservation laws, and thus sanction cruelty to all wildlife killed for crop protection. It is imperative that animals be unconscious before being electrocuted. The Committee considers that the shooting of flying-foxes to control predation in the fruit crop industry is inhumane. Queensland Animal Welfare Advisory Committee (2007) Advice to the Minister for Primary Industries and Fisheries. Martin L. (2007) Is the fruit you eat flying-fox friendly? The effects of orchard electrocution grids on Australian flying-foxes (Pteropus spp., Megachiroptera). 10th Australasian Bat Society Conference. American Veterinary Medical Association (2007) AVMA Guidelines on Euthanasia. NSW Flying-fox Licensing Review Panel (2009) Report to NSW Department of Environment and Climate Change. Expert Working Group of the Animal Welfare Committee of the National Health and Medical Research Council (2008) Guidelines to promote the wellbeing of animals used for scientific purposes. Australian Government. 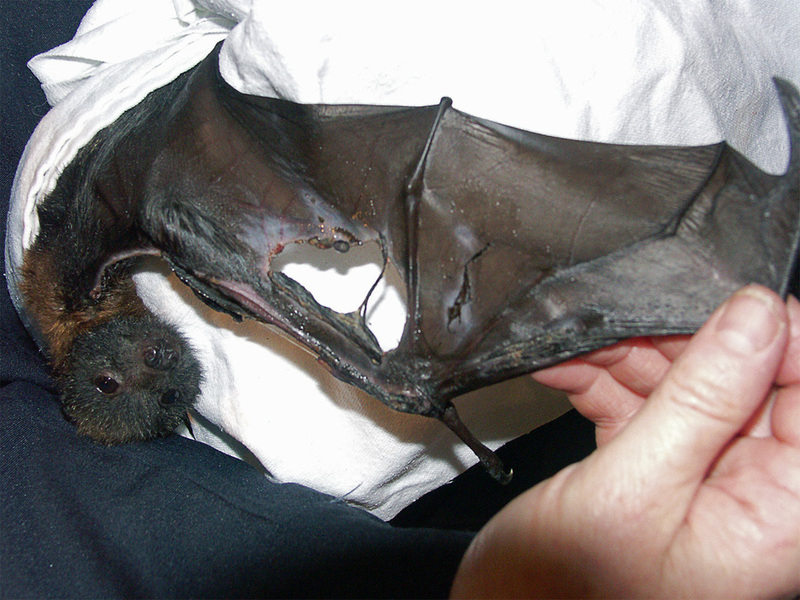 Divljan A, Parry-Jones K, Eby P (2009) Report on deaths and injuries to Grey-headed Flying-foxes, Pteropus poliocephalus shot in an orchard near Sydney, NSW. Justice William M. Connolly (2008), Nebraska Supreme Court, for the majority in a 6-to-1 decision. Nelson J. (1965). Behaviour of Australian Pteropodidae (Megachiroptera). Animal Behaviour. 13:544-557.